Wildflower Hall is a fairytale luxury hotel situated at an astonishing elevation in the majestic surroundings of the Himalayas. The hotel offers its guests with a wide variety of accommodation options as each of the 85 suites and rooms present in this high end hotel offer a spectacular view of the evergreen forest. The rooms of the hotel are well furnished and tastefully designed to allow its guests to live like a lord. Facilities like marble baths, serene wilderness, hand-knotted rugs, private fireplaces and teak floors to make your stay more comfortable. After spending an active day in the hotel, enjoy a rejuvenating session at the luxury spa pavilions present in the hotel. The guests can satiate their taste buds at the in-house restaurants. The well trained staff of the restaurant serve their guests with a pan-Asian and continental dishes. For those who enjoy being in the high spirits would love to visit the Cavalry Bar which offers the guests with high quality wines and liquors. A stay at Wildflower Hall during the vacation is surely going to stay inked for a long time in your cherished memories. 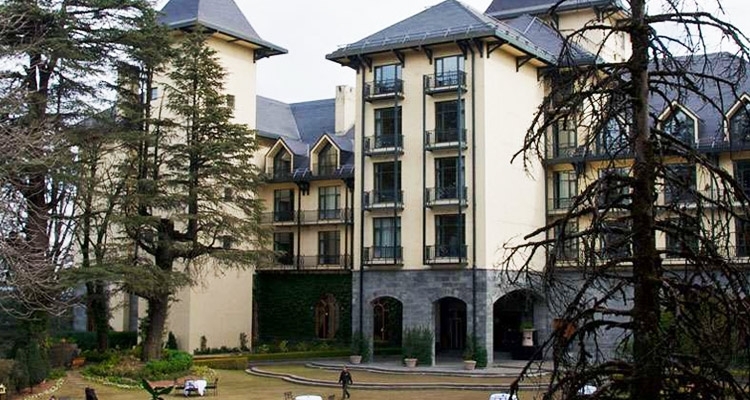 Wildflower Hall Hotel Mashobra is a one of the most sought after heritage hotel near Shimla. Spread over the wide area of 23 acres the hotel lies at a convenient distance of 13 kms from Shimla. This luxury dwelling surrounded by pine and cedar forest is a sheer symbol of comfort and luxury. In the erstwhile the hotel was the residence of Lord Kitchener, the former British Commander- in-Chief. This luxury hotel for accommodation offers its guests with 85 well-appointed rooms, suites, guest rooms, walk-in closets along with a spacious marble bathroom. The nearest airport to reach Wildflower Hall hotel, located in close vicinity to Shimla is the Kullu airport. Private air charters can be also be booked to reach the hotel. It will take around 45 minutes time to reach the Chandigarh airport. On arriving at the Chandigarh airport sit back in the car for a convenient drive of four and a half hours to reach Wildflower Hall hotel. Those planning to reach Wildflower Hall hotel by train can board any of fast trains running frequently between Delhi to Kalka or Delhi to Chandigarh. On deboarding at Kalka on can board a train to Shimla. It would take approximately 4 hours to reach Shimla. A Large number of trains ply between Kalka and Chandigarh. One hire a private taxi or opt for a pick up service to reach the Wildflower Hall hotel from either Shimla or Chandigarh railway station. The wildflower Hall hotel is located at a convenient distance of 13 kms from Shimla. 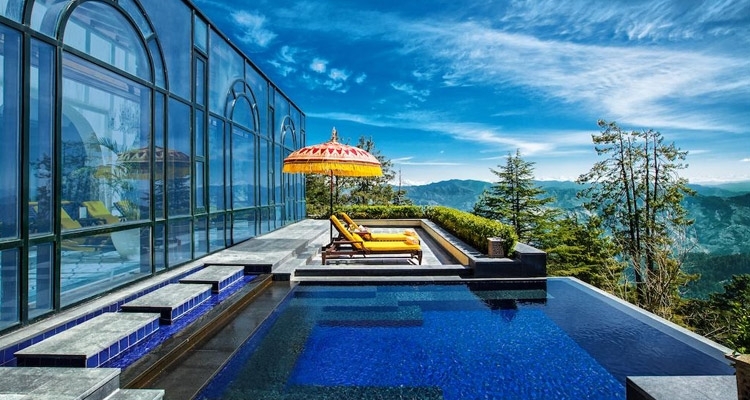 The hotel ideally located next to the Charabra village on the Shimla- Kufri road is well connected by road from Delhi, Kalka and Chandigarh. It will take approximately around 8 hours to reach Shimla from Delhi and around 3 hours from Chandigarh to Shimla. It will take a further drive of 45 minutes to reach the Wildflower Hall hotel from Shimla. At the Wildflower Hall hotel, our guests have the chance to indulge in exotic spa treatments which comprises of a wide range of beauty treatment along with a series of relaxation treatments. Our therapists will help you in selecting the best type of treatment and rituals that best suit for your body type. These treatments have been inspired by the age old Indian traditions which have been under continuous evolution over 5000 years. Relax and rejuvenate while enjoying the serenity of the spa suites and spa pavilions which offer soothing views of the majestic Himalayas. 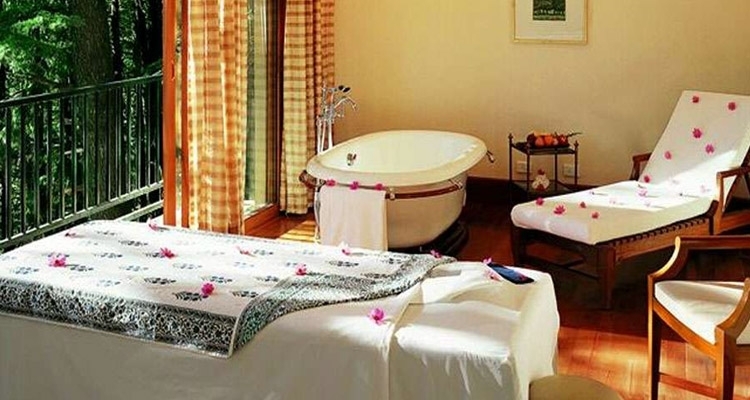 The spa specializes in Balinese Massages, Thai Massages, Aromatic Massages and Stress-Relieving Massages. Under the Signature Indigenous Rituals it allows one to have a pure mind and body connection. The session is planned according to one's body type. During this therapy the guests would enjoy an Indian head massage followed by an inhalation therapy. The entire session is divided into four steps which commences with an Indian head massage followed by herbal poultice massage. After the poultice massage is followed by a body exfoliation session under which an aromatic steam bath provides for opening of the body pores and concludes by hot water bath. The Massage Therapies are based on five elements namely Earth, water, Air, Fire and Space which are present in every substance of this world. These massages signify the need for the harmony with nature. This revitalizing body treatment which features a unique blend of Indian spices that are used for exfoliating and polishing by massaging the body with a special spice oil. This process is followed a body repairing step with the help of anti – ageing and detoxifying body wraps. These processes will help in toning and tightening of the skin. Later enjoy an aromatic bath after which your body will be pampered with a soothing body massage using body firming oils. This therapy session concludes with an application of soothing moisturizer that will help in toning your skin. In the Skin and Nail Care session helps in cleansing and exfoliating of the skin. The Hungarian facial massage is provided to stimulate the micro –circulation and helps in relieving skin tension. The second step under this therapy helps to provide the skin with fairer complexions with a gentle peel off pack. This is followed by covering the face with peony and rose scented face masks that helps reducing the appearance of fine lines and wrinkles. A wide range of salon services like pedicure, manicure, threading and waxing can also be enjoyed during this session. This spa session is especially designed for men which helps in deep cleansing and exfoliation of the skin applying a warm thermal mud mask to remove the impurities. In the manicure session special attention to the different needs of a man’s hand is given and also involves buffing of nails. In the sports pedicure session the feet are therapeutic soaked and scrubbed using a mineral scrub which helps in smoothing and exfoliation of the skin. All the rooms and suites of the hotel are well equipped with modern day facilities such as direct dial telephones, DVD players, personal bar, satellite colored T.V. The interiors of the room are tastefully designed and well furnished. Each of the rooms has a spacious marble bathroom featuring both a bathtub along with a separate shower cubicle. While sitting in the room one enjoy admiring the picturesque natural beauty of the scenic hills covered with dense forests of cedar and pine trees. The in-house restaurants present at the Wildflower Hall hotels features a large open terrace which offers a panoramic view of the beautiful mountains. While dining in this majestic restaurant enjoys savoring upon a lavish and exclusive Continental and Pan-Asian menus. The professional chefs and well trained attends feel delighted to serve their guests with their platter featuring an array of lip-smacking cuisines. Enjoy dinning at Lutyens for a spectacular dining experience. The interiors of the hotel tastefully crafted to preserve its old world charms. While seated in the restaurant the guests can admire the sight of beautiful gardens which in turn makes for a perfect ambiance for the evening. Cavalry Bar is a great place for the people who love to be in high spirits. The interior of this bar is beautified by the wood paneling and also features an original artwork which help in creating an old world charm. The bar is well-stocked with high qualities of fine spirits and wines. It is a prefect place to visit after a lavish dinner.